Subscribe to our newsletter and get a free murder mystery party game! NEW RELEASE! Jeff Thompson, the producer of Tribal, a reality tv show set on a tropical island paradise has been murdered! But whodunnit? For 23–30 guests and one or two hosts, set in 2003. Dastardly railwaymen, upright sheriffs and sly good-time girls in this game for 10–14 guests and a host, set in the Wild West. An expanded version of this game is also available, for up to 24 guests and one or two hosts! The patriarch of a wealthy family is dead – who will inherit his fortune? And, more importantly, who murdered him? Find out in this game for 6–9 players and a host. Fat Stan's Speakeasy, Chicago, at the height of Prohibition. Glamour, music and murder! This game is for 15–32 guests and 1–2 hosts. A murder mystery game for 15–30 guests and one or two hosts, set at a glamorous Parisian casino, featuring espionage, crime, intrigue and murder! An expanded version of this game is now available, for up to 30 guests! This game for 6–12 guests and a host takes place at an exotic Hawaiian beachside luau. Tourists and locals mingle and party – but one of them is a murderer! An expanded version of this game is also available, for up to 22 guests. Set in Victorian Egypt, grapple with evil from beyond the grave in this game for 6–9 guests and a host. An expanded version of this game is also available, for up to 19 guests and a host! It's awards night in Hollywood, in this game for 16–32 guests and one or two hosts. But some of the stars seem to be thinking about how to commit the Best Murder! The superheroes are trapped in their base – who's going to save the world from the evil ReptoMan? And their manager has been found dead, so one of them is a killer and traitor… find out who, in this game for 8–12 guests and a host. Two rival pirate ships descend on a tropical isle – who will find Captain Flint's buried treasure? And who murdered him in the first place? Find out in this murder mystery game for 12–16 guests and a host. At the Tremaine School of Magic, danger stalks the corridors. Will the students and professors solve the mystery and save the school from an ancient enemy? Find out in this game for 13–17 guests and one or two hosts. It's curtains for Broadway star Jackson Turner, but the drama's just beginning. There's no business like murder business, in this theatrical game for 8–13 guests and a host. A peaceful (if rather peculiar) village community has been disrupted by a savage murder. Find out who did it in this game for 12–16 guests and a host, set in an English village in the 1930s. Venture into the heart of darkness in this murder mystery game for 8–11 guests and a host, set in 1930s Africa. Lord and Lady Westing have died in a tragic accident, but why did they arrange this unusual party to read their will? Was it truly an accident? – or something more sinister? For 11–16 guests and a host. A glamorous and dramatic murder mystery game for 17–33 guests and one or two hosts, set on an Atlantic cruise liner at the outbreak of World War I. Spies, intrigue and secrets abound! Blackheart the pirate, scourge of the Caribbean, is dead. But where is his treasure? And where are his revenge-seeking crew? Find out in this game for 10–15 guests and a host. NEW RELEASE! It's the 1950s, and Flo's Diner in small-town USA is set for the dance-off competition – but bad-boy Ricky Johnson has been found murdered! This game is for 14–20 guests and 1–2 hosts. It's the Swinging Sixties and rock group Marmalade Skies' manager has just been murdered. Find out who did it in this game for 10–14 guests and a host, set in the Karma Club commune in 1969.
Who killed JoJo Bones, proprietor of the Exotic Emporium of Enigmatica? Find out in this game of circus folk set in 1952 Florida, for 12–15 guests and a host. The Sheriff of Buzzard Creek has been found dead, in the stables of the Gold Nugget Saloon. Find out who did it in this game for 12–15 guests and a host, set in the Old West in 1869. Magic carpets, disguised princes and princesses, magicians and mystics in this game for 18–24 guests plus one or two hosts. It's an enchanted evening of thievery, investigation, betrayal, and magic! Cunning spies and ruthless murderers threaten the Summer Ball of an ancient university, in this game for 14–18 guests plus a host, set at ivy-clad Maudlin College at the height of the Cold War. It's the big horror movie awards night, in this Halloween game for 16–32 guests and one or two hosts. But some of the stars seem to be thinking about how to commit the Best Murder! Set in 1980s Texas, when tycoons were smooth and shoulderpads were immense, for 11–15 guests and a host. Oil, scandal and family rivalry make R.J.'s birthday party a dangerous business! Walter Raleigh, Queen Elizabeth I, William Shakespeare, and many others, try to solve the murder of the Archbishop of Canterbury in this game for 13–21 guests and one or two hosts, set at the royal court of England. You can buy our games in US dollars or in UK pounds, from anywhere in the world, as you prefer. The price will be converted back into your own currency by your card issuer or by PayPal. You can buy our games in UK pounds, from anywhere in the world. The price will be converted back into your own currency by your card issuer. (or click here to go back to the other version of this page where you can pay via PayPal). "My wife and I just did A Speakeasy Murder (Halloween 2014) in our home for 32 guests. We had a BLAST. We are already planning to do another of these games next Halloween. Our friends are still talking about the party. We have a huge list of things we will do differently next time to make it even more fun for them and easier for us." "My husband & I completely rented an old hotel, converted its lobby into a speakeasy, involved the staff in our game, and ran A Speakeasy Murder all weekend! Guests loved that they always had things to do, that there were 'easy' parts as well as more challenging roles, and that even if people didn't figure out how the murderer was, they could still talk smack about accomplishing other goals (like killing a rival, finding a lost heirloom, or making some money…)"
"Over the last couple years since our friend invited us to a play-through of Curse of the Pharaoh we fell in love with your games and have since gone to two more of your mysteries run by our friend. Last year my girlfriend hosted Dead Man's Chest and for our New Years Eve party last year I hosted A Speakeasy Murder Mystery. I just wanted to thank you for writing up some awesome games, I've never seen a person frowning by the end of any of your mysteries (well if you don't count excessive drinking).I could tell you all of the escapades in our mysteries, but mostly I just wanted to thank you all again." "We ran A Speakeasy Murder last weekend with 22 guests and 1 host. This was our fourth Freeform Game and the largest one yet. A great time was had by one and all, including our brand new guests. I think this one was my personal favorite for the creative costumes our guests came in. I asked each of our guests for their “mug shot” before we started play and put together this compilation. I thought you would enjoy it! Thank you for another excellent game." If you would like to tell us how your party went, please click here to send us your story. "The story was so much fun! We had close to 30 people and all were praising the event all night. It was a great interactive experience that we would definitely do again!" 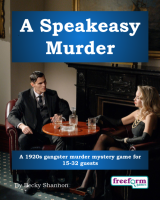 A Speakeasy Murder is a dinner party murder mystery game for 15 to 32 guests and one or two hosts – download the free introductory pdf file. Join us in a dazzling evening of evening of Prohibition, showgirls, gang-wars and murder! You will be in the middle of the action and it will be up to you to wheel and deal with the other guests. Can you achieve your goals, keep your secrets hidden and survive A Speakeasy Murder? It's up to you. Anybody who is anybody is here at Fat Stan's Speakeasy tonight. Al and the band are desperately belting out their jazziest tunes, Lola and the girls are singing and dancing like their lives depended on it, and Tony the barman is handing out Stan's Specials like there's no tomorrow. Which there won't be, for poor Scabface Martins. He was one of Fat Stan's pals, and a very popular guy down at the Speakeasy. A masked hoodlum in a long black cloak burst into the room during the interval after Lola's big number, and the poor sap was peppered with so many bullets he looked like a swiss cheese. The only way in or out of the Speakeasy is through the secret door from Dora's Dress Shop, and the doorkeeper swears that nobody has come through that door in either direction for over an hour. So it figures it musta been someone in the Speakeasy that plugged Scabface, and even worse: they're still in here now! Officer Pilkington is one of the regulars, so everyone's waiting for him to work out who dunnit. Too bad he's as dumb as a sack of bricks. The only thing he's managed to do right so far is to lock the exit and search the back rooms for hidden hoodlums. He found nobody. Fat Stan is determined that everything should carry on like there ain't no problems: so the remains of poor Scabface have been put in the Janitor's cupboard and, after a quick cleanup by Pickles the cleaner, the show is carrying on with fevered intensity. But who coulda wanted Scabface dead? Which one of the crooks, bums and no-hopers that make up the Speakeasy's staff and guests is the filthy lowlife that plugged him? And do they plan to strike again? A Speakeasy Murder lasts for about four hours and is suited to an evening. It is often played over a meal – a finger buffet if possible to allow guests to circulate and talk in private. "Ever since playing Cluedo as a kid I have wanted to be in a "real" murder mystery. I made it a goal within my 30 before 30 bucket list, and so for my 28th birthday was able to live out my childhood dream! A Speakeasy Murder did not disappoint- it was all of our first times playing a game like this, and we all got a bit confused (doorkeeper included – whoops!) but everyone had so much fun and we are planning on doing murder mystery every winter. Thanks for the twists and turns! A great evening! " The free introductory pdf file contains an introduction to the game, a cast list of all the characters, and a copy of the Chicago Courier – plus details of how to buy the game. Sly Swanson – a debonair gambler: a big hit with the ladies! A Speakeasy Murder is unlike many murder mystery games. Although the game starts with a murder, most of the characters have more important things to do than to investigate it. And the killing may not be over – it is unlikely that everyone will survive the remainder of the evening! A Speakeasy Murder is played just like a murder mystery game. You may be trying to solve the murder, but primarily you are (initially at least) concentrating on your own goals and objectives. Unlike most boxed murder mystery games, A Speakeasy Murder lets you decide how to achieve your goals and thwart your enemies. "I would love to play again!" On the evening of the game the guests are met by the organizer, the Doorkeeper, and welcomed to Fat Stan's Speakeasy. They then receive their detailed backgrounds – including dark secrets, objectives and money. The fun then begins as they form alliances, blackmail each other, steal items and maybe even try to murder one another! Along the way they may uncover some of the mysteries of A Speakeasy Murder. Who is smuggling hooch, and who is brewing moonshine? Who are The Chimera and Balthazar? Who carried out the St Swithin's Day Massacre? Who wants to be a Hollywood talkies star, and who once robbed a train? And, of course, who killed Scabface Martins? Depending on what the players choose to do, there are several different possible endings, but finally everyone finds out how they did, and what secrets everyone else was concealing. Sometimes you have too many guests and you need more characters. So we've written a free extra character for each of our games that you can add in, and some of our customers have created their own characters for their parties and are kindly willing to share them. Please note that we haven't always tested these – and they may not tie in exactly with our games. IMPORTANT – if you've bought the game, you can download the files for these characters from the download page where you got your main game files. Contact us if you need the link and password to get back to that page. A Speakeasy Murder costs £30.00 (GB pounds) or US $49.99. You can buy it in either currency, from anywhere in the world, as you prefer. The price will be converted back into your own currency for you, at today's exchange rate. IMPORTANT: please be aware that you are buying a game to download from our website, not a boxed game that we will send you in the mail. Payments on these payment buttons are handled by WorldPay, and you can use any normal credit or debit card. The prices are quoted in pounds, but it'll be converted into your own currency by your card issuer. Or click here to go back to the PayPal payment buttons, if you prefer. Our payments are usually handled by PayPal, but you don't have to have a PayPal account to buy this game. If you prefer, you can just buy it with your credit or debit card in the normal way. You'll see that option when you click the button above. Or if you'd prefer not use PayPal at all, that's fine too of course – just click here to get alternative payment buttons where you can pay directly with your card. We offer a Cast Iron Guarantee on all our murder mystery games. If you're not completely satisfied with A Speakeasy Murder then please let us know within 30 days and we will refund you. See our full terms and conditions here.